Last year was the first time I really started exploring with felt. The Free Crochet Zombie Hat Pattern was my experimental project that I ended up publishing with the felt tutorial included. Though I love to crochet, I have such a hard time staying motivated when it comes to making all the tiny embellishments for crochet projects. Don’t get me wrong, I absolutely love the finished look of them, but the small pieces can be so time-consuming. Especially when it comes to making the same exact pieces over and over again to create one simple project. 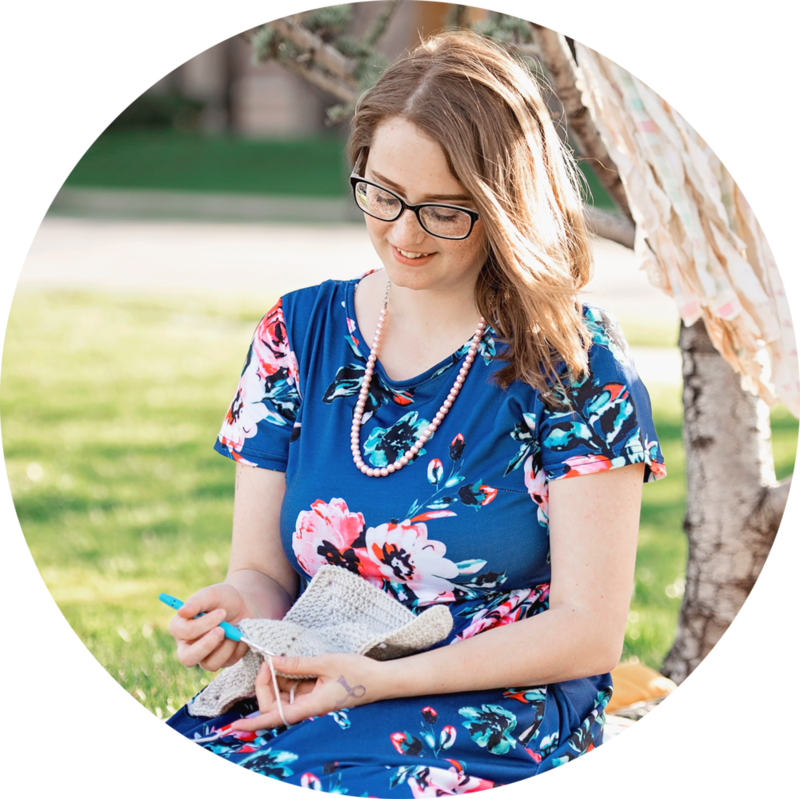 I looked into many different alternative methods for creating small embellishments that included; using buttons, weaving strands of yarn in between stitches, fabric, and even embroidering on projects with a sewing machine. None of it worked with the vision I had in my head, so I kept looking until I picked up some felt sheets at the craft store. I cut up some white felt to use for the Zombie’s teeth, and then sewed them onto the hat base. By the end of the project I was really happy with the finished look. I published the pattern shortly afterward and got a lot of positive feedback with the added felt. It was a friendly reminder that when you think outside the box, there are new possibilities to create something magical. I knew I wanted to keep utilizing felt and bringing it into some of my craft tutorials. With that being said, the Black Bear Hat Pattern didn’t start out with felt being incorporated. I had originally designed the crochet pattern last year (it was all crochet), but decided to sit on it a little while longer. I brought the finished projects to a local event I was a vendor at, so I could see what people thought of the new design. To my excitement, they sold extremely quickly and many people asked if I would have more in stock. When I came back to the design earlier this year, I knew I still wanted to play with the overall look of the design before I fully released the pattern. I made a few different nose shapes, added multiple colors to the hat base, and lastly changed out the regular snout and nose for the felted version. That is where this cuddly little fella came into view. I love the simplicity of this project and how the felt adds a touch of personality to the bear. 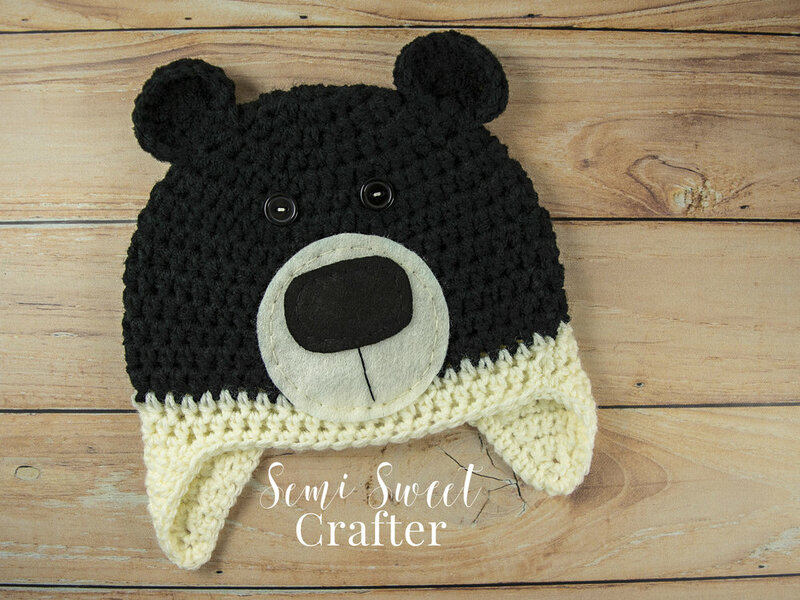 Introducing my newest FREE crochet pattern, the Black Bear Hat. But no need to worry, this cuddly little fella is all cuteness and no bite. Please Note: I have included affiliate links, linked to the supplies I used in this crochet pattern. By clicking on these links you have the option to save/purchase the same materials I used to create this pattern. By purchasing materials through these links, I will earn a small commission with no extra cost to you. Thank you! To purchase an optional ad-free, fully downloadable, PDF version of this pattern, including both written instructions and the added photo tutorials, visit my Etsy Store here or my Ravelry Store here. Sl st into next st, tie off. Switch to cream yarn. Fasten off leaving a long tail to sew the ears onto the base of the hat (see pattern pointers). Using the Felt Snout and Nose template pattern, cut the template and trace the pattern onto cream/black colored felt. You will be using cream colored felt for the snout and black colored felt for the nose. Sew the nose onto the snout and place a couple of stitches down the center of the of the snout. Finish off by securing the snout onto the hat base by using cream colored thread (see pattern pointers). Using two 15mm black buttons for eyes and the white thread, secure the eyes onto the hat base above the snout (see pattern pointers). Using black and cream colored yarn. Cut 20 strands of yarn 28" in length (10 of each color), then separate 10 strands for EACH earflap. Fold the 10 strands in half (five of each color), and secure them to the hat. Finish the tassels by braiding them (see pattern pointers). This is what the base of the hat should look like. You may have more or fewer rounds depending on what size is being made. For this example, I am using the 12 month size. This is what the ears should look like. For placement, I like to place them towards the top of the hat but down just a slight bit (about where the increase rows on the hat stop) so they have that slight turn outward. For the Felt Snout and Nose pattern, you can print off the FREE template included with this pattern by following the link here. 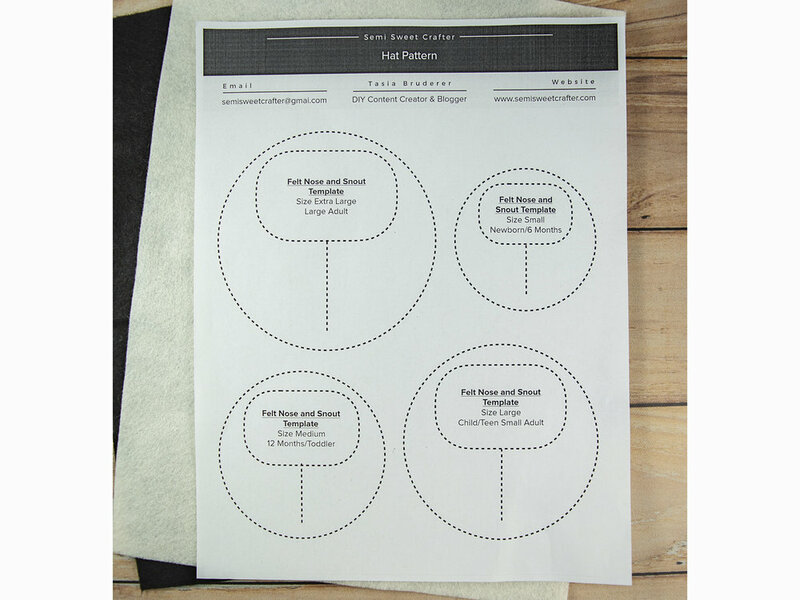 The print out includes multiple sizes to accompany each individual size of the crochet hat base. Once you find the size you need, cut out the snout/nose using the dotted lines. You will then trace the template onto felt using a water-soluble marker (optional). Cream colored felt for the snout and black colored felt for the nose. Showing in picture 3 is a completely optional step where you can trace 1/4 inch dashes onto your project, using a water-soluble marker, to help keep your stitch lengths even and symmetrical. Once again this is a totally optional step and you can just eye your stitches if you wish. After tracing both pieces onto felt, cut them out and place the black nose on top of the cream snout. Using black thread, sew stitches all the way around the nose securing the nose to the snout. Finish off by placing a couple of stitches down the center of the of the snout. Aline the Snout on top of the crochet hat base towards the bottom of the hat. Using cream thread, sew stitches all the way around the snout, securing the snout to the base of the hat. Using the two 15mm black buttons for eyes and the white thread, secure the eyes to the hat base, slightly close together and just above the snout. Small embellishments may be a choking hazard to small children and babies, please use your best judgment with attaching small objects onto handmade projects. If you would rather not use buttons you can crochet some eyes instead. Using black and cream yarn. Cut 20 strands of yarn 28" in length (10 of each color), then separate 10 strands for EACH earflap. Fold the 10 strands in half (five of each color), and loop them around the bottom of the earflap to attach them to the bottom of the hat base. Splitting the strands into three equal parts, brain the strands all the way down and knot the bottom. Trim the remaining ends sticking out so that they're all the same length. Repeat for the other side.